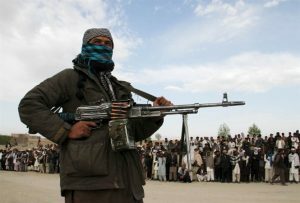 The Taliban insurgents have chopped the one hand and one leg of a young man on charges of robbery in western Herat province of Afghanistan. According to the local government officials, the incident took place late on Monday afternoon in Obe district. Provincial governor’s spokesman Jilani Farhad confirmed the incident and said the limbs of the young man were chopped after he was convicted of robbery in an open court organized by the Taliban insurgents. He said the man was arrested around a month ago and was kept inside a jail run by the Taliban insurgents until he was tried openly on Monday. Herat is among the relatively calm provinces in West of Afghanistan but the anti-government armed militants are active in a number of its remote districts, including Obe and Shindand. This is not the first time the militants of the group have publicly tried the civilians on various charges. At least two men were also kidnapped from this province around four years ago and their limbs were chopped on charges of robbery.